Isola di Ortigia (Island of Ortigia): Ortigia is the historical center of Siracusa (also known as Città Vecchia). 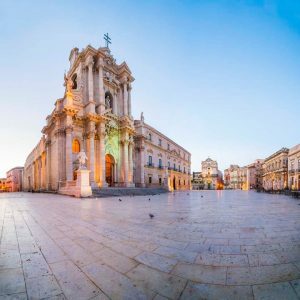 Ortigia is home to a lot of historical landmarks (some of which are “must sees” that I will list below). Duomo di Siracusa (Cathedral of Syracuse): Originally a Greek doric temple built in the 5th century BC, this beautiful ancient Catholic church was designated a UNESCO World Heritage site in 2005. Piazza Duomo: The Piazza Duomo is considered among the most beautiful squares in Italy. I would visit the piazza every day and people watch, gaze at the beauty of all of the buildings in the square, eat gelato and do homework. Tempio di Apollo (Temple of Apollo): The temple is one of the most important Greek monuments on Ortigia in Piazza Pancali. It dates to the early 6th century BC and is one of the most ancient Doric temples in Sicily. It’s fascinating to stand next to a temple that is still standing after thousands of years. Teatro Greco (Greek Theatre): Another UNESCO World Heritage site, the Greek Theatre of Syracuse has history dating back to its creation in the 5th century BC. In present day, the theatre is still used to perform Greek tragedies at sunset (without sound systems because of the theatre’s spectacular acoustics). Even if you don’t understand Italian, watching a performance in the theatre is an incredible experience. The theatre is part of the Parco Archeologico della Neapolis (Archaeological Park of Neapolis) that is home to a famous quarry (Latomia del Paradiso) and other Roman ruins. Mercato di Ortigia (Ortigia Market): The market is held every morning except for Sunday and it’s everything you would hope an Italian market would be. You can buy cured meats, fish, fruit, veggies, cheese, cannolis, and more! I’m salivating just thinking about perusing each vendor’s stand and ending up at the Fratelli Burgio shop for some cheese and vino. Chiesa di San Giovanni alle Catacombe (Church and Catacombs of San Giovanni): Syracuse’s most extensive catacombs lie beneath the Church of San Giovanni. The church and catacombs are only accessible on guided tours but are definitely worth exploring. 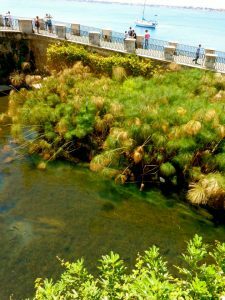 Fonte Aretusa (Fountain of Arethusa): This fountain is a beautiful, natural fountain on the island of Ortigia. According to Greek mythology, the fountain is where the nymph Arethusa returned to earth after escaping her undersea home in Arcadia. The fountain is mentioned in many works of literature and is one of few places in Europe where papyrus grows naturally. Basilica Santuario Madonna delle Lacrime (The Sanctuary of Our Lady of Tears): This unique looking church consists of a basilica and a crypt and was modeled after the shape of a teardrop. The church houses a statue of the Virgin Mary and has a small museum that visitors can tour. This church is located right by SAI’s partner school in Siracusa, Syracuse Academy! Castello Maniace (Maniace Castle): The castle is situated at the far point of Ortigia and was constructed between 1232 and 1240 to protect and defend the city. The castle has been used not only as a fort and castle, but also as a prison. Visitors can tour the castle and see beautiful views of the Mediterranean. Corrado Basile (Papyrus Museum) and L’Angolo del Papiro (Corner of Papyrus): At both destinations, visitors can see papyrus in its natural state and learn about its production, preservation and its restoration. Beaches: A few beaches that I liked to frequent with my friends are Lido Le Nereidi, Lido Arenella, and Spiaggia Pineta del Gelsomineto. 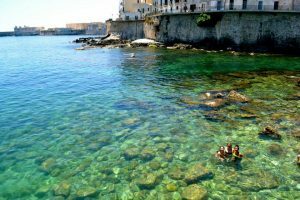 However, my favorite place to enjoy the Mediterranean is on the rocks at Forte Vigliena in Ortigia. Other fun activities include: boat tours, snorkeling, and watching the sunset on Ortigia. Mount Etna: As one of the most active volcanoes in the world, Mt. Etna is in an almost constant state of activity. Enjoy a hike around the lower slopes or visit one of the vineyards! Catania: The second largest city in Sicily and one of the ten biggest cities in Italy. Catania is known for its history and has one of the biggest examples of baroque architecture in Italy. Taormina: A beautiful hilltop town on the east coast of Sicily near Mt. Etna. The town is known for its ancient Greco-Roman theatre and sandy beaches. Palermo: The capital of the autonomous region of Sicily located in the northwest boasts a 2,700 year old history. Teatro Massimo and the Palermo Cathedral are among some of my favorite landmarks in Palermo. Aeolian Islands: Islands off of the blue seas of Sicily’s northeastern coast, the Aeolian Islands (Vulcano, Lipari, Salina, Panarea, Stromboli, Filicudi and Alicudi) are a little slice of paradise. You can hike the original volcano that gave volcanoes their name or bathe in the sulfur baths. Agrigento: A city on the southern coast of Sicily famous for its Valle dei Templi (Valley of the Temples). The temples are some of the largest and best-preserved ancient Greek buildings outside of Greece itself. San Vito lo Capo: A small seaside town in northwestern Sicily. It’s known for its beach and festivals. 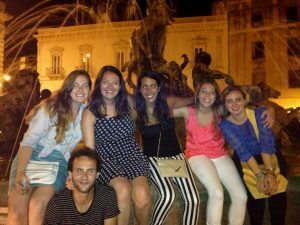 If you are considering studying abroad for the summer and want to live in a place with incredible history, weather, beauty and food, there is no better place to study than in Siracusa through SAI. Living and studying in a small town provides so many unique opportunities to interact with locals and immerse yourself in the culture and history. 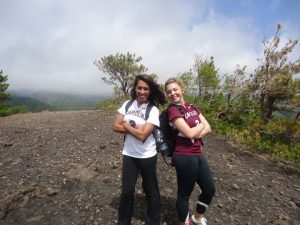 To learn more about how you can study abroad in this magical location, visit www.saiprograms.com/sicily/syracuse.